Johannesburg’s Central Business District has a similar fate as Hillbrow, although effort is now being put into developing the area. Most of Jozi’s office blocks and high-rise buildings are to be found in CBD. There is also a lot of abandoned houses, some of which have been blocked with masonry on the first and second floor in order to prevent people from moving in. 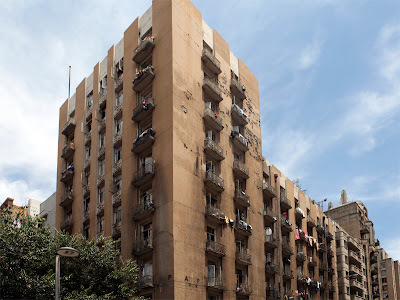 Other buildings have been taken over by or rented out to refugees from other African countries. 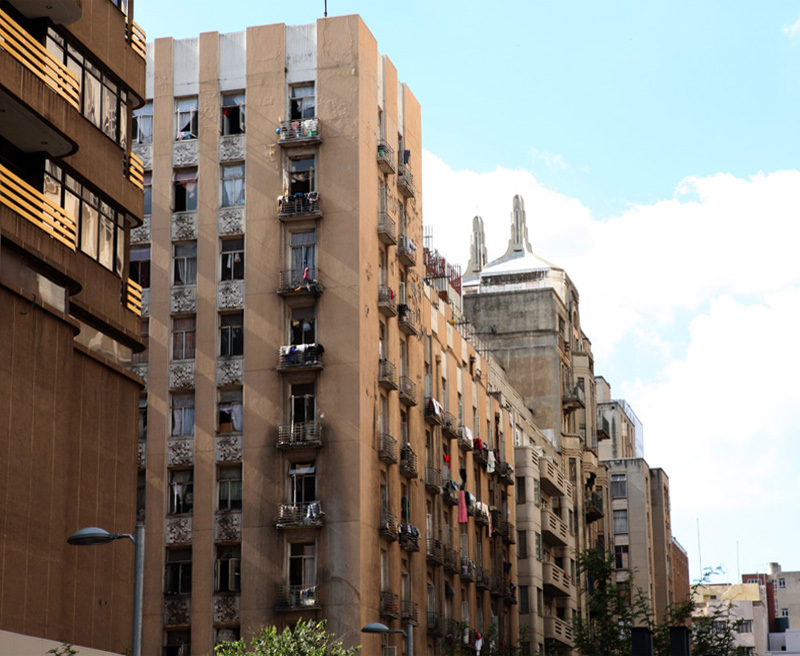 Those houses in CBD can be easily identified from outside as clothes hang outside the windows. Accompanied by two social workers who work for Médecins Sans Frontières (Doctors Without Borders) we visit a run-down art deco building which is inhabited by 1,200 refugees. We get up to the 3rd floor where we meet people whom we can interview. We interview two people from Simbabwe (who make up the majority of refugees in South Africa) outside of their two room „apartment“. The first room of about 10 square meters serves as a kitchen and also has a bed for several people. In the second room of about 25 square meters there are several beds which are only separated with cloths. Six to eight people live in that room. No room for privacy. The toilets which are to be found outside at the end of the hallway are in the worst condition imaginable but we get told that there are even worse buildings without any water nor electricity. is short for South Western Townships, meaning that Soweto is an aggregation of different townships around Jo’burg. Black People in Jozi speak only with greatest pride of Soweto probably due to the fact that the uprisings against the apartheid regime in 1976 started there. Sowetans seem pretty well off like middle class people. Most of them live in proper houses with water and electricity as opposed to inhabitants of other townships which have to live in makeshift shacks. On a Sunday afternoon we go to watch a concert at a place called Thesis Social Club. People in Soweto are proud and very friendly. There is also a special way of dressing up. Sowetans are quite stylish. At Thesis we meet musicians, graphic designers, filmmakers, graffiti artists and the like. We go to visit Masimbambane School in Orange Farm which is a township located approx. 50 km south of Johannesburg in the Gauteng Province. Orange Farm is the largest informal settlement in South Africa, with most estimates giving a population of 350,000 people. Masimbambane College, a private run school, is in part funded by the city of Vienna. We get a tour through the college by a staff member. As soon as the children see the woman they run up to her and hug her. We are taken to class rooms and to the kindergarden. The kids love to pose in front of the camera. Then they come close and give me a hug. As I do the same there is no holding back. More and more kids come running and hug me. What a different feel to meeting Europeans, it’s great! is a township east of Pretoria which was set up on a former farm. In the 1960ies black people were forcefully removed out of one of the capital’s suburbs to different townships, one of them being Mamelodi. The name means Mother of Melodies after president’s Paul Kruger ability to imitate birds. The township is home to the Mamelodi Sundowns of SA’s Premier Soccer League. We visit two schools which are part of the YDF (Youth Development through Football) program, a program organized by NGOs and German association GTZ (Gesellschaft für techn. Zusammenarbeit). The program is aimed at developing life skills of young members of underprivileged communities in leadership abilities, ecological awareness and HIV/AIDS prevention etc. We accompany one of the pupils to her home in Mamelodi and get to know her mother and her siblings. We are allowed into their shack where we are struck by heat and the constrictions of an underprivileged life. We go to see a live concert of Zubz, a rapper from Simbabwe, who seems to make it big in SA. There is also a gig of Black Dillinger, a rather classic reggae band. The lot of them seem quite old (around 40) and they look as if they had smoked too much dope in the past except for the singer, who seems younger and healthier. On the keyboard appears a skinny and even older guy who does not speak a word. He just hits the keys emotionlessly which every now and then emanate strange reggae sound effects. The guy appears on stage wearing a suit and a pink rucksack which dangles from his shoulders like an old plastic bag. As he plays he does neither take of his jacket nor his rucksack which only contains a book or two. After the gig the guy leaves the stage, puts his keyboard in a sack and walks off the scene, still without having a said a single word nor having taken off the pink rucksack. Cool, innit? Salt Rock is part of a suburban area which is north of Durban. Suburbia seems to have neither a beginning nor an end, it stretches over miles and miles along the beach. A coast road winds up and down through an endless number of hills. The sea is pretty rough, but its water fairly warm. On the beach we see hordes of crabs which hide under the rocks as soon as we spot them. We watch a group of dolphins riding the waves like surfers do. They skillfully manage to swim on the rim of the waves. Every now and then one of the dolphins jumps out of the water and shows his grey body. The flora on the coast is lush (subtropical) with a great variety of trees including palm trees. There are colourful birds with long tails (makes them look like skites) and even monkeys. After 10 days of work interviewing and filming people we head down south to the southeastern coast. We pass Battlefields, a high plain were the Zulus fighted the Boers in the 19th century. From the highway there is not much to see except for green pastures, cattle and the occasional shanty town. The landscape reminds us of Sweden as it is rather flat and has needle trees. The last 10 km before Durban the highway is winding downhill in direction of the city, but shortly before Durban we turn north to a place called Salt Rock. We watch a monkey crossing a street. He looks both ways left and right before he crosses the road. The monkey then makes his way through a fence onto private property with an „armed response“ sign in front. Quite surprisingly he does not get shot. Apparently quite a few monkeys get hit by cars instead. As I go jogging later I see another monkey sitting on a piece of lawn in front of a house. The monkey whose back is turned towards me munches quietly. As he gets aware of me he turns around his head to look at me without any emotion. Does he charge me? Salt Rock is part of a tourist area with B&Bs, some hotels and holiday apartments. Although the Christmas (and summer) season has recently started there are not many tourists around. It is apparent that all restaurants and B&Bs are run by white people and that the waiters and servants are black. That’s a bit different from Joburg. On Sunday we go to a public beach close to Salt Rock. At first there are hardly any people but then more and more people show up. They arrive in their cars with the music pitched up to the max. Some of them have a barbecue party in the parking area of the beach. The place gets crowded and messed up, it’s a bit chaotic and great. Tuesday Dec 15 is our last day in South Africa which we spend in Jozi. In the morning we take a minibus from Melville to the center. This is my first ride on an African cab as we used a rental car during most of our stay. The bus is in poor condition, it squeeches, actually it seems to fall apart every minute. The driver does not tell us where to get off, thus we go to a different spot than intended. We arrive in Newtown, a central district of Joburg which we like a lot. Newtown is about to develop into Jozi’s cultural center. There is the Market Theater, there are artisans stands and several places to go out. It is also close to Oriental Plaza, home to Joburg’s Indian community. By accident we meet a new friend of ours, a graffiti artist, who takes us (in an allegedly stolen car) to Goodman Gallery in a different suburb. We visit the exhibition of a young South African artist and then wait to be picked up by another friend, a multimedia and film producer. That friend takes us out to lunch in a fancy neighbourhood. After lunch he invites us home. We have a few beers and a swim in his pool. He changes cars and takes us in a big BMW to a little shopping center in Melville where we have an appointment with yet another friend. In the car he plays dark African House Music at full volume which makes us feel great and a little decadent after all what we have seen in this country. A little later we walk back to our house in Melville. For the last time we pass single familiy houses with „armed response“ signs and electrical fences. That’s in stark contrast to the actually nice athmosphere in Melville and the warm air that we breathe. From September 13 to 20, I participate in an international video art workshop at Modem museum in Debrecen. 15 to 20 video artists from different European countries are invited to develop their projects within a week. Debrecen is situated in the far East of Hungary within 50 km of the Romanian border. The Modem is a big museum for contemporary art that was built 3 years ago. The museum and the square in front look like any other modern museum in the West would look like. Modern architecture in the former East now seems exactly the same like in the West. In order to reach Debrecen I travel by train from Vienna to Budapest and from there to the East. I change trains at Keleti station in Budapest and get a seat in a compartment with a young student who sits at the window. Except for that boy nobody on the train speaks English. We travel for hours and hours. As I don’t know when I have to get out I have to ask people for the whereabouts of the train at every station where we stop. After some time a bald-headed guy enters the compartment. He barks at the young man in Hungarian and takes the seat right in front of him although 4 other places are available. The bald guy seems eerie and looks aggressive. Just some days before my trip I read in the newspaper of serial killings committed on Roma people in Debrecen. The far right in Hungary is getting stronger and stronger and the nationalist Fidesz party is constantly gaining votes. With that story in mind I watch the bald guy. He just looks like a rightist extremist. The student looks scared, in one particular moment he even seems to cry. The bald guy soon falls asleep but wakes up every now and then. I watch both of the men and try to catch the student’s gaze which is reflected in the window but the young man continues to stare out of the window and does not react on the signs which I make. I just don’t know if the baldhead threatens him and he does not dare to get up. I spend one hour being proccupied until I finally get an idea what to do, just as the train stops at another station. I open the door of the compartment and get out on the aisle. I leave the door open, a young woman comes inside and takes a seat. The baldhead gets up and leaves.